Need A Killer Sales Contest Idea to Motivate Your Team? Try "Top Gun"
Ever run sales contests and notice that the same reps are consistently getting it done while others are consistently lagging behind? It’s no surprise that your best performers are your most competitive and will likely score high in any contest you run. If you want to get more out of your top performers they need to compete at a level that forces them to go outside of their comfort zone. Not everyone is going to be an “A” player, but the select group that fits into this category needs to be challenged on a different scale. Think about elite military aviators like Ice Man and Maverick in the Top Gun clip above, or even professional athletes. They go against the best of the best day in and day out to challenge themselves and take their talents to the next level. You can encourage your top reps to do the same, by creating a contest that pits the best against the best. Set the bar high and make the incentive attractive to drive maximum results. Allow others in the company to work their way up into the highest level to compete against the best once they earn their place. Prize: Remember: Your highest performing reps are probably making the most commission. Select an experiential sales incentive, like tickets to see a favorite local sports team play, rather than cash. The key with sales gamification is to mix things up. Static leaderboards and repetitive sales contests get old fast. Implementing new ideas like this Top Gun competition will keep things fresh and top reps challenged. 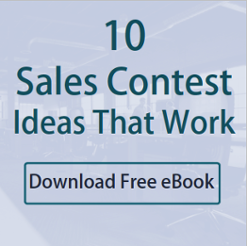 Check out our free “10 Sales Contest Ideas That Work” guide! This great sales contest idea from “Top Gun" is a gem to motivate your team and push your sales reps to the top of the leaderboard.